Posted on 24. June 2018 by P.J. How to write a Kotlin DSL – e.g. for Apache Kafka and in German: Wie schreibt man eine Kotlin DSL – z.B. für Apache Kafka? Posted on 17. June 2018 by P.J. The first change in this verison is that the OfflineCache instance now is a Singleton and shared between all instances of MapView objects in an application. This allows for more than one MapView to use the offline cache mechanisms. The other change is that now for a pointer (mouse) move detetction when the pointer is over the map, an appropriate event is generated. Posted on 5. June 2018 by P.J. I just came upon the possibility that in Java it is possible within regular expressions to turn case sensitivity on and off. This is no new feature, it has been there since Java 1.4, but I never saw it before and thought it might be worth a post. The “(?i)” switches the pattern to case insensitive, and “(?-i)” switches it back to case sensitive. The java API doc https://docs.oracle.com/javase/8/docs/api/ lists these as “Special constructs”. And although they use the parenthesis, thesi constructs do not capture anything in a group. Posted on 2. June 2018 by P.J. 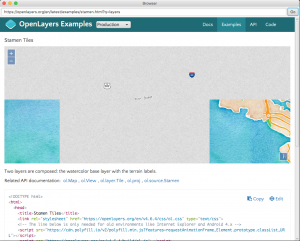 mapjfx now ow uses OpenLayers 4.6.5. Posted on 9. February 2018 by P.J. Other browsers have no problem with these pages. I do not know if this is some bug in WebView – or more probably in WebKit that’s used internally, but there is nothing I have found up to now that I could do to work around. This map-tile loading problem only seems to happen with OpenStreetMap servers, I have up to now found no problems when using Bing Maps. Edit 29.03.2018: At the moment I do not see these issues when running with Oracle JDK 10, feedback about this is very welcome! Posted on 23. January 2018 by P.J. note to self: when I need to access the docker host from within a container running in Docker for Mac, the hostname is docker.for.mac.localhost. Posted on 22. January 2018 by P.J.